2. I mailed it to your old address...I got tired of updating my address list and just started using people's old addresses. For those of you that I do like, I hope your announcement got to you! 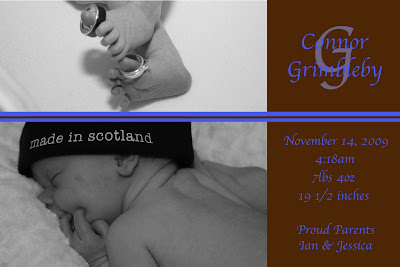 we just got your card & it is beyond cute... made in Scotland was such a sweet touch. I have been doing our Christmas cards & my parent's with photoshop/illustrator for a few years now & I practically pull my hair out every time... I always have this grand idea as to what I want them to look like but actually accomplishing what I set out to do is beyond frustrating. This year I bought a few design elements from istockphoto.com & went from there. you did a great job, Connor is such a cutie.